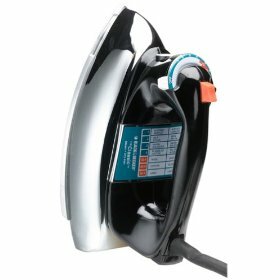 This iron looks very sleek and very modern which can easily fool the eye of the buyer. I'm not particularly a huge fan of this iron. First off, it’s very bulky and heavy, which quickly gets annoying while ironing. Second, I often find that the water you put in the iron for steaming drips out of the holes on the actual iron surface, leaving nasty burnt water marks on it. It has even once left marks on my clothing due to the water spilling out. This also gets annoying because when you want to use the steaming feature, you sometimes don’t have water in it, because it all just fell out. Also, it has sometimes caused "pulls" in my clothes leaving marks in the form of a little line. Depending on where the pull happened, it would ruin my clothes because they were very visible pulls that were created. I am a firm believer in paying a little more for something that will last you longer, and serve you better. I feel that an iron is an item that fits with this belief. If an iron will work better on my clothes, it’s worth shelling out a few extra bucks. I don’t find it worth saving a few dollars if in the long run it ruins your clothes or dies quicker, ultimately leaving you to have to spend more money. I would not recommend buying this iron to anyone. Although it looks cool, there are plenty of better irons out there that you can purchase that will do a better job. I only used this iron for about 2 and a half weeks before I realized I couldn’t take it anymore. I quickly went to the store and purchased a new one too. I think that if you buy this item or already own it, you will find that you agree with me.